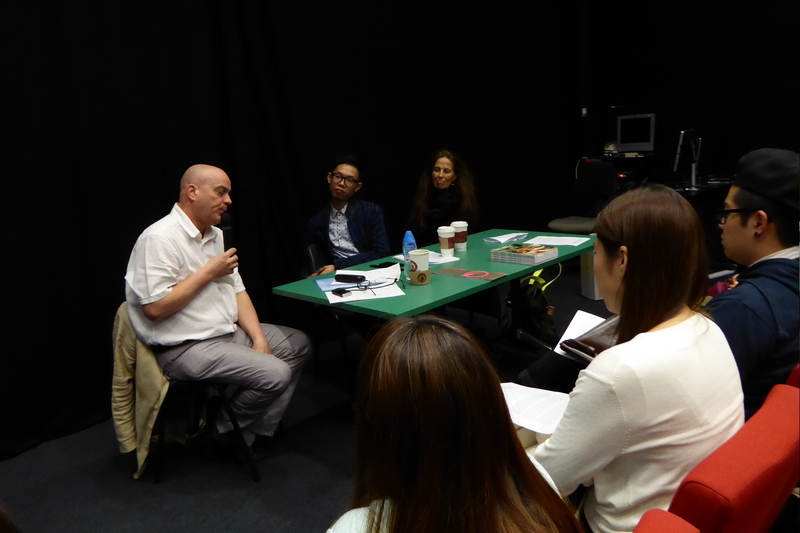 My first post from the Hong Kong stage of my international adventures and another day for art speak…this time, the panel discussion ‘The Future of Visual Arts within the Expanded Field of the Moving Image’ with speakers Dr. Isaac Leung (practicing artist, curator and researcher), Professor Jonathan Harris (Professor of Global Art and design at the Winchester School of Art/University of Southampton) and Menene Gras Balaguer (Director of CASA ASIA). I had previously spoken to Isaac and Jonathan online via email and social media, however I had never spoken to them in person, so it was great to finally make a real connection and talk further. The discussion examined how the advent of digital art has changed the global art system as well as reconsidering the traditional boundaries within the visual arts. 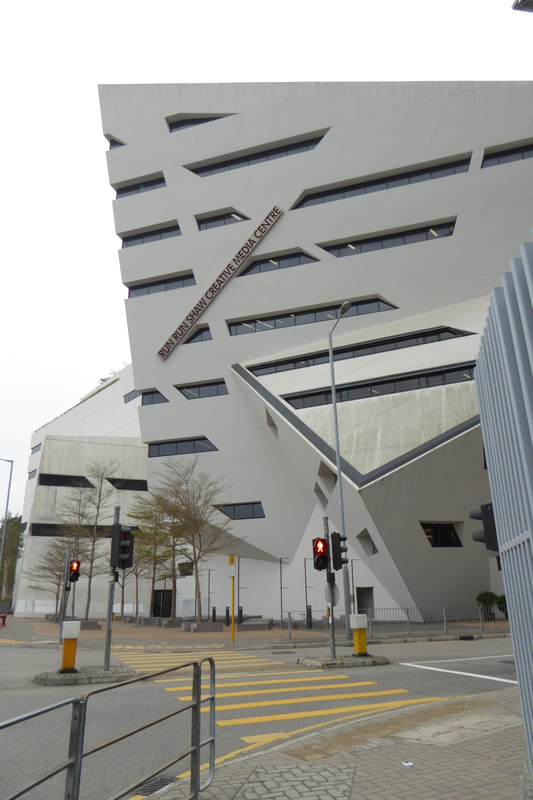 It took place at the Run Run Shaw Creative Media Centre designed by Daniel Libeskind at the School of creative Media, City University of Hong Kong out in Kowloon Tong. 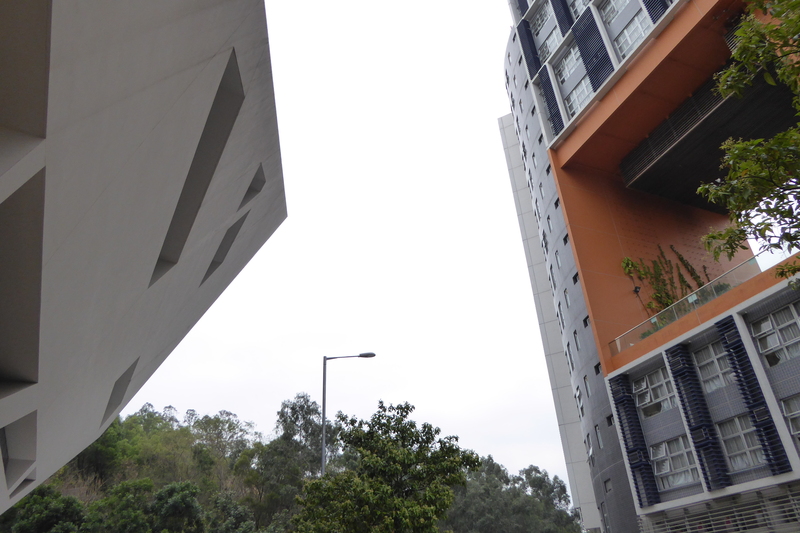 Architecturally distinct on the university campus, the building is white, angular and minimalist cutting into the lush green natural landscape of Hong Kong behind whilst contrasting with the other campus buildings across the road. 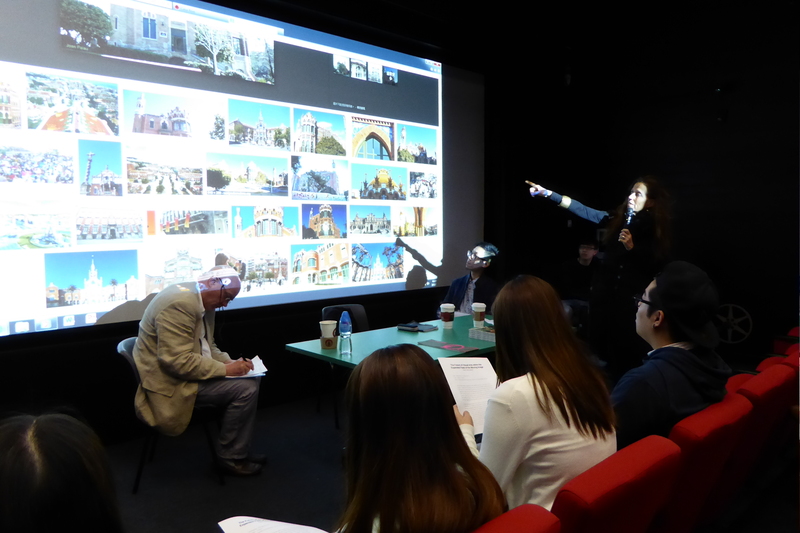 The discussion initiates the new exchange with Videotage and CASA ASIA, and follows on from Isaac’s recent research visit to Barcelona. Menene Gras Balaguer began the session by answering which kind of institution is CASA ASIA? The building is part of gardens and consists of many pavilions…it similar to a local hospital…there a lot of private partners who fund projects, a main Director, a structure in which private companies are involved, and an internal structure including economic/education/political problem directors. We are not the Asia Society but we know each other. 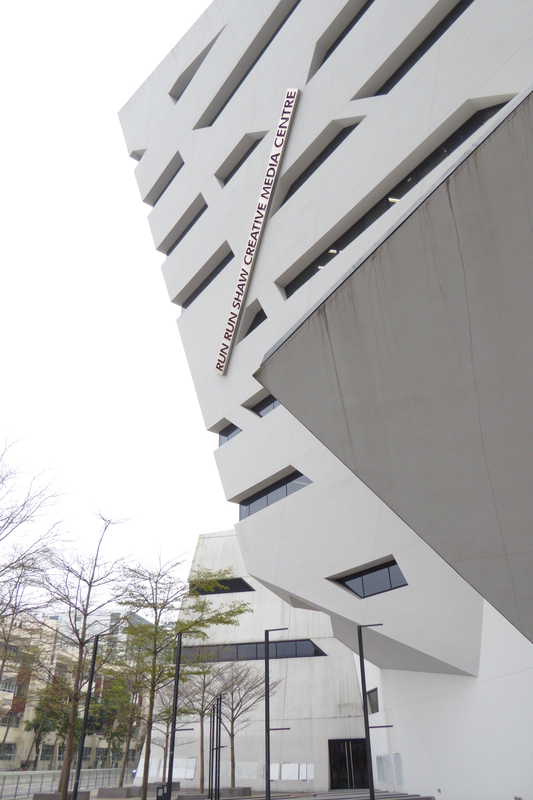 In the world there are three kind of institutions who deal with the same kind of issues – Asia Society (Hong Kong and New York), Asia Link …can make comparisons to HKW in Berlin, and ZKM in Karlsruhe, or you also have Asia House in London. We work with and deal with the whole of Asia…from Iran to Central Asia, over to New Zealand. However, we don’t deal with the Arab countries. This stays out of our field of work. Through working with these countries, it allows us to have different links and different problems. I am looking at the importance of digital narratives, which has recently been published in a book…the relationships between different works made in different parts of the world. We can never miss something even if we are technically advancing, as we are knowing more about how to produce these moving images…the importance of narrative is always there. The narratives are essential to all kind of video art in the art world…this is basic, but we sometimes forget that. In the beginning it was so experimental you only needed a camera and the value was itself…whereas nowadays, digital instruments and weapons gives a value to a video production, adds an aesthetic value. Which kind of narratives are shown? What do we see behind the image? How do we judge and appreciate this kind of production? How powerful are narratives in these videos? Jonathan Harris has worked with Menene before, placing her work into a more global context. There are as many questions as there are answers about globalisation. The two things that fascinate me are global relationships…global meaning the whole world and how the world relates to each other. Asymmetry is important, it’s about power relationships and how they work in the world…important today and Art Basel Hong Kong. Power relations and how the y interact…where ever you go in the world they have their own specific dynamic. Here in Hong Kong, we have to think about its relationship to the UK and to the PRC…what role culture and art have in these power relationships. More indigenous visual art infrastructures, how to places develop their own resources, institution, producers, forms of writing in a global world…their specific and always changing. Jonathan stated that Winchester School of Arts have over a third of the Chinese international students studying visual arts in the UK. There are a constellation of terms we hear on a regular basis…specific and changing things…the idea of a moving image, digital and internet, and how these fit together in a global art system. Also interested in the idea that there are certain art forms, that are in specific ways global, and uniquely to do with globalised conditions, primarily installation art and moving image. It has been claimed as important…my book is focussed on art forms, types of writing and social conditions of art since 1990 – ‘Contemporary art in a globalised world’. Need to trace a more global history of (contemporary) art. Why did Art Basel decide to take over the art fair and how did it relate to the fairs in Miami and Basel? What does this signify about Hong Kong? What is contemporary art’s relationship to high technology and new media? Where does Asia start and finish? We are dealing with a complex social, political and colonial history. I include “Western Asia”, first referenced in Terry Smith’s book…his avoidance of not wanting to use “Near East”. “Western Asia” has become this PC term…it has problems as a term as does Asia itself. They all have specific histories. You don’t ever solve the political and conceptual issue of terms as they always bring baggage and values. The mass of experience we have in our everyday world, we can’t reduce it down…we must try to make some sense of what it looks like and sounds like in relation to a broader set of experiences. We must acknowledge relative autonomies. We cannot separate our idea of globalism from global capitalism. Every place has a specific space and history of capitalism and globalism. Even though we might have some things in common…in the past homogenization. Today it’s about retaining a sense of uniqueness in a global system. Constant change taking place…recognise heterogeneity instead of homogenization. Q: Installation and moving image as global art forms…what is the argument for or against? JH: They don’t originate from any one place…they don’t come from traditional art forms. It’s difficult to say that it comes from one particular place…not hybridised. The argument against that, is if you take the loaded term traditional, it is equally the case. I’m intrigued why it becomes a fetish for the unique value of new media. I wouldn’t say that one art form is more globalised than another. Q: Related to web art…an art forms that is more accessible to globalisation because of its distribution capability. MGB: All of it starts with the copy…fax art…the way of getting through starting this universal communication with artists from all over the world. Important not to value artworks through technique otherwise we miss what makes sense…what is important is what makes sense of the piece of work…artistic and aesthetic value of an artwork. Also the geography is important…the colonial to post-colonial. Art Basel has the whole world…the power from the far East to the far West. 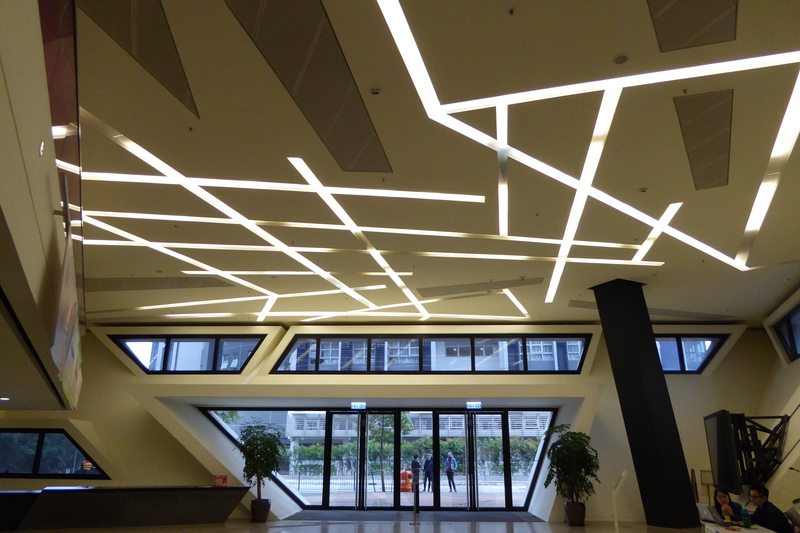 It is linear not North to South…Hong Kong is a hub for them as a hub for the auction houses who are competing all the time with the galleries and art fairs. Art Basel is like Armani, Chanel…selling a franchise to other countries much like the Guggenheim. This is the way in which capitalism works. JH: South Korea sees online art as a key part in democracy…there are powerful arguments for new media being properly placed in being able to enable discourse and communications. It reifies and freezes certain happenings at that moment. Q: More in performing arts and have the same questions about what is Asia, contemporary etc…why the words, descriptions lead to and why do we need them? Do we need control? Who is the author? Crisis of the same narrative being repeated. I was inspired by the Osage project ‘South by South East’…a fresh way of conversation that filled in a lot of blond spots from North, South, East and West. How do we avoid the same dynamics and change them? How do we have more decentralisation of power? JH: I agree with you…one of things is a need to focus on intra-Asian developments rather than outside of Asia. Have to limit the work we need to do…I have to try to explain my own situation and how it relates to other parts of the world. If you are English like I am, you try to make sense of the other side of this asymmetry…”the West”. These terms do not have the same relevance as they did ten years ago. I am trying to explain my situation. We don’t have to think of these terms as “West” and “East”, but we can’t avoid some of the power relations. 75% of contemporary is sold by Sotheby’s or Christie’s. There are many other things that you can focus on instead. Q: What is your interpretation of Art Basel in Hong Kong? Happy to see someone writing about it. Speaking from the point of view of a local artist, growing up in Hong Kong and as a an art educator…and selected as a homegrown artist from Hong Kong. There is a lot of unease on my part and other artists about this scenario. The government here is happy…their point of view to sponsor art is when they can see this capital flow into Hong Kong and out. When it comes to globalisation it is important to look at the intersection for prosperity for ones own city and something more fundamental for art making. JH: They are a very powerful organisation with specific political goals. They saw Hong Kong as a strategic place to get a grip on the whole of the Asian contemporary art market. Their partnerships with Deutsche Bank and UBS and why they want to be part of art fairs. The patrimony of the arts since the crash…a way of trying to create a penance against profits. It is capitalism. MGB: The art market isn’t there, its at Sotheby’s and Christie’s who have the relationship and clients who want to invest. IL: I feel very problematic when I see the world Asia…Korea, Asia Cultural Complex…how government imagine arts and what they are investing in. Suddenly see Asian artists in international Asian art contexts but never see them in Hong Kong. The question “What is Asia?” will always exist.